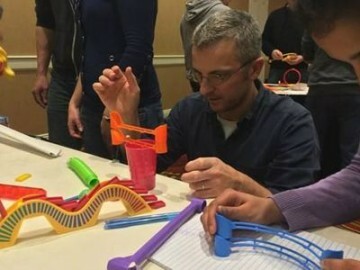 Chain Reaction is a thought-provoking team building event with a focus on getting the whole group to work together, requiring proficient project management skills to design and build an intricate sequence of reactions. Chain Reaction is a story of many chapters … each team will be given a different section of a story and the blueprints to build parts of a large structure. Teams must build a structure that integrates with the other devices. These ultimately lead to an exciting finale where all the creations are joined together to achieve a spectacular common goal. The game is based on teams collectively aiming to complete a section of mechanical devices and moving parts – at first in isolation and then joining with the other teams. Teams have to be aware of the impact their decisions have on those around them. Each group constructs one of the sections remotely from the others. They may communicate with the other groups within certain constraints to ensure that that the sections are compatible with each other. Team dynamics and human resource management are put to the test in the planning phase as the design is divided into small segments, requiring both human and physical resources to be divided into smaller working groups. 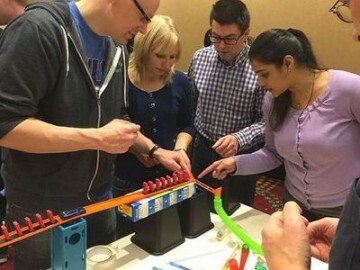 The build and testing phases require co-ordination not only between teams, but between distinct technical skills and project management strategies as the teams face their ultimate challenge – does each component function and does it connect with the next to create a cascading series of cause and effect? 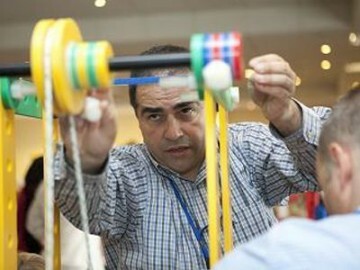 Once completed the first team sets off their Chain Reaction, which in turn triggers the next team’s creation, and so on until a giant Chain Reaction has been completed around the room. whenever they like, to collect materials and tools to build their part of the structure. use their imaginations to build a working device that will integrate smoothly with the other devices. The event finishes when the structure is put together with the unveiling of their continuous working device, where teams will read out their part of the story as the chain of reactions happen. If successful, the end result will be the dramatic finale that everyone has been working towards… epic novel or total flop, you decide! No single team triumphs… as in Chain Reaction you all succeed in collaboration. This session commences with the Team discussing the meaning and use of communication … and its importance to team understanding and clarity of purpose in the work place. The focus of the event is to get your entire group working together towards a single end result. This takes the shape of a project brief, posed to your whole team at the start of the event. This is a natural follow-on from the morning session. It involves the Team in facing a number of diverse problems, challenges and tasks; which are designed to test the ability of the team to work together in the face of many, and constantly, changing challenges. The aim of this event is to get the whole team working together to complete one essential project which is a route-way linking the efficient supply and transport of manufacturing output. Teams are challenged with building the ultimate sustainable highway.